Catching up, the 3-Day Novel, and Sushi Shelter 101. You know how sometimes a week or more goes by and then you start to get these friendly reminders about that blog of yours that you enjoy writing that you’ve been neglecting because you’re busy lately and you’ve not just been neglecting the Internet but also your whole life? This week we actually ate a meal of bacon and deep-fried cheese bread. I’ve been totally wrapped up in work fatigue – the two weeks before school starts at a university are busy and insane and frustrating and holy hell why didn’t I plan my time around going to bed early and getting up on time?! – and my own whiny brand of anxiety over a little contest I’m participating in this weekend. What contest, you might ask? For some reason I thought it would be fun to participate in the 3-Day Novel Contest, in which I spend the Labour Day weekend on lock down, pounding out a novel in 72 hours. Not only that, but I paid $50 to do it, so, given my temperament and inability to function after a certain hour in the evening, I’m either an idiot or a masochist but it’s too early to tell which. I’m thinking of taking the Hunter S. Thompson approach to writing this thing, so if you find me bug-eyed and jabbering incoherently, clutching a quart of cheap dark rum and nine tubes of pickle-flavoured Pringles in the garishly lit aisles of Shoppers Drug Mart at 3:00 in the morning on Sunday, just hand me a sack of grapefruits and a hunting knife and point me in the direction of home. I’ll draw a map on my arm, just in case. These long, meandering, seemingly pointless paragraphs do not bode well for success in this competition, and if this was to be practice, I’d have failed. 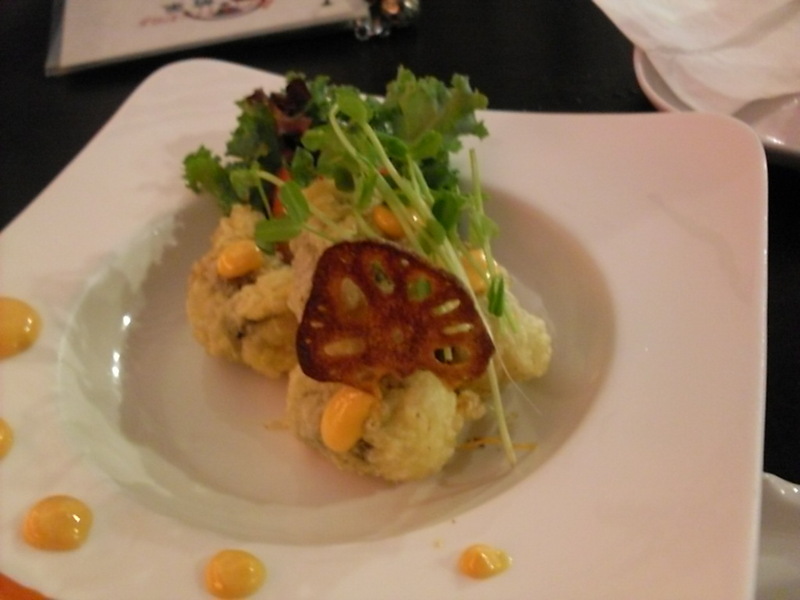 The point of this blog post is a weird little restaurant called Sushi Shelter 101. Last night we met up with a friend of Nick’s from work, Aaron, and went 90 minutes away from home to Port Coquitlam and this Sushi Shelter 101 place. Odd name, and I got the sense that the decor was themed along the lines of a luxury fall-out shelter. 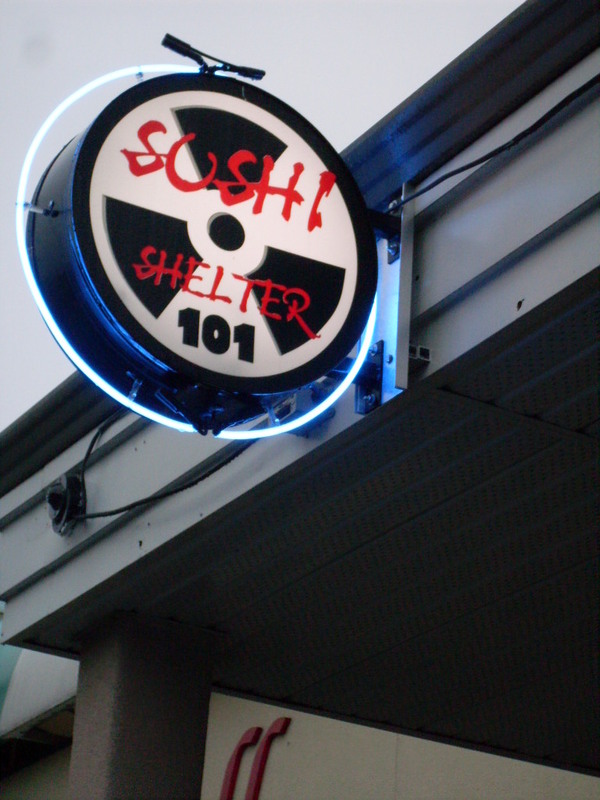 In the nuclear/zombie apocalypse, a hideaway like Sushi Shelter 101 is where I want to be. Even better if they bring me a steady supply of Ocean Delight, which is a deep-fried crab cheese thing that I am devastated I don’t have right now. 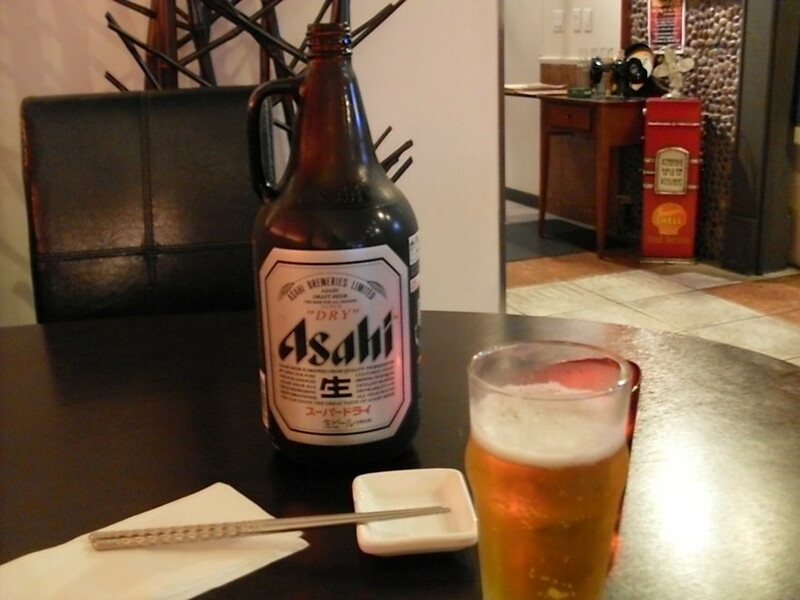 They have different things here, and Aaron classified it as non-traditional, modern Japanese. 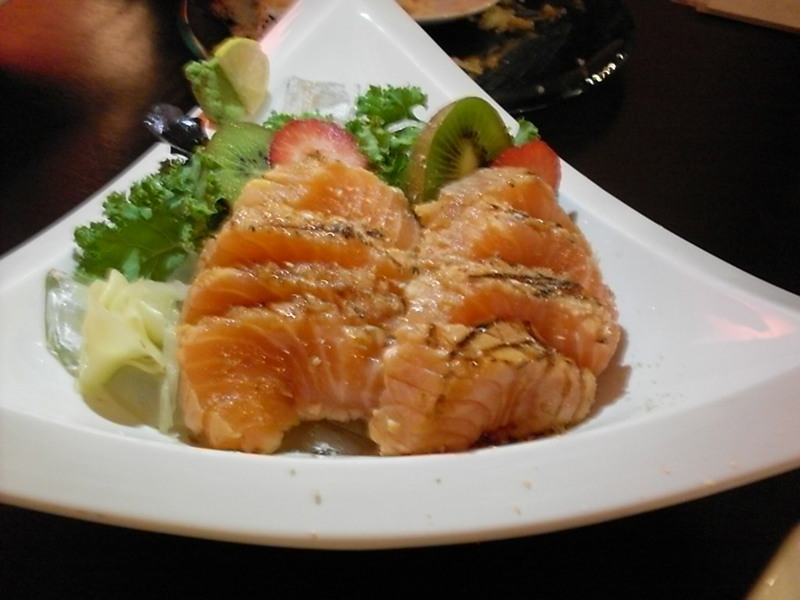 The Red Bamboo and White Bamboo were two things I can no longer live without – tender, beautiful cuts of salmon and tuna wrapped in nori, tempura-battered, and then quickly deep-fried, rarely have I had such a succulent bite of fish, so perfectly barely cooked. I wish every single picture I took wasn’t a horrendous mess of blur, but the lighting was dim, and for it we were all infinitely more attractive. The beer also helped. OH! And it would qualify as neglect if I didn’t tell you about the oyster, which isn’t on the menu, but which you can ask for with a wink and they’ll know what you mean. The oyster comes on a tin-foil pedestal, cut into bite-size chunks and gently fried, then reassembled and topped with Japanese mayo, shredded seaweed, and something else which I couldn’t put my finger on, but which I need you to go and taste in case you can solve the mystery. There were also California rolls covered in peanut sauce, which was odd but good and I don’t know what to make of it yet. There were these vegetable croquettes, and this chicken yakitori … there was so much. And it wasn’t expensive. The service is unparalleled – the nice waitress would ask if she could remove every single scraped-clean plate, and she would bring special treats if for some reason the chef thought we were waiting too long. We were gifted a plate of vegetarian spring rolls, a small bottle of warm sake, a plate of lamb maki, and a dish of mango ice cream that had the purest mango taste I’ve had in a dessert ever. If you are in Port Coquitlam for any reason at all, make a trip and go to this place. I am sure that you will come out of the whole experience equally as gut-busted full and delightfully perplexed as I did. So, yeah. 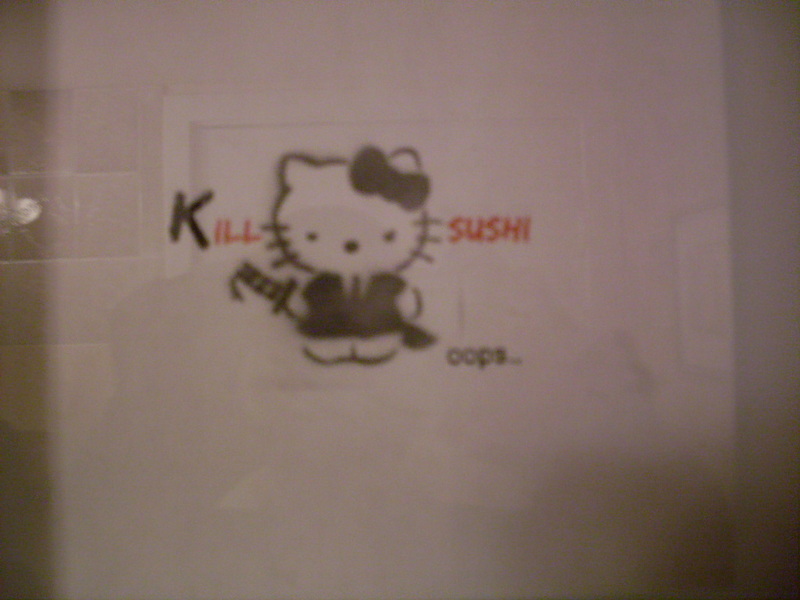 Sushi Shelter 101. Do it. And wish me luck in my contest. With any luck, I will win, become a famous author, achieve that rare combination of literary acclaim and obscene wealth, and then open my dream restaurant, the opening of which you are all invited to. < Previous Garden report: We have so much chard, and the threat of too many cucumbers. Next > If you’re going to tart up your veggies with cheese sauce, do it with this cheese sauce. I wonder if they know you’re writing reviews (what with the photo-taking), and that’s why you get all the freebies. This place looks pretty radical…when would I be in PoCo, though? I don’t think that was it, as Aaron had been there quite a few times and had received varying amounts of free plates, but perhaps I shouldn’t sell the place on freebies, which may or may not be a part of the regular dining experience. It IS pretty cool; if you can find a reason, make the trip! It should be fun! I think it will seem less daunting when I’m in it. You’re sewing an entire baby wardrobe?! You’re insane! Soon you will get to have all those things again. Soon! Whee! …welll…lll…ll… not an entire wardrobe, but all of the fitted diapers and diaper covers. We’re cloth diapering and I did the math for at-least-24-diapers times at-least-two-sizes-right-away times about-$20-a-pop and thought, hell, I can sew… but you know, I DIDN’T do the math for at-least-24-diapers times at-least-two-sizes-right-away divided by weeks until he gets here… 😀 At least not until the other day, when I went EEK!